An Awesome Sunsation (aka Maizy) is a favorite in the lesson program. She has had an extensive show career and is now ready to teach you how to win. Maizy is excellent with beginners but is a lot of fun for advanced riders. 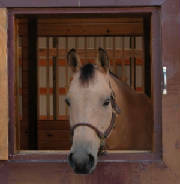 She will settle into a slow and sweet western jog or move out in a ground covering hunter trot. Maizy is a gorgeous black color with fantastic confirmation and a sweet and very willing disposition. Simply a Color Junky (aka C.J.) is an Azteca. 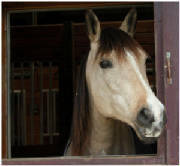 She is a cross between an AQHA stallion and a Lutsiano Mare. CJ has the brain and disposition of a quarter horse and the movement of the Lutsiano. C.J. will happily move out english, even though she is only 14'2" hands. She is also very brave over jumps and wonderful in dressage and trail obstacles. Her looks are stunning and she knows it. She is always ready to be groomed and given treats. Heza Awesome MIster (aka Harry) is a registered AQHA gelding. He is always meeting you at the gate and ready to go. Harry is extrememly laid back and takes everything in stride. 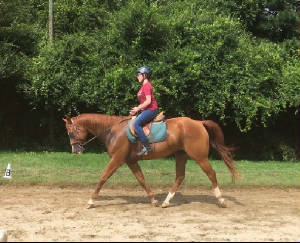 He will work a trail pattern, compete in Western Dressage tests, move out in a ground covering Hunter stride and also stand all day to be groomed. With Harry's pedigree and disposition, you will get noticed. 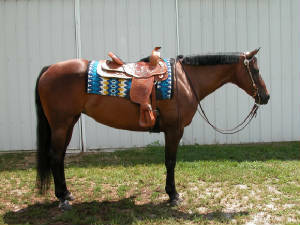 Potential Jeanie (aka Turtle) is a tall and elegent AQHA registered mare. She is a beautiful mover in the show pen and always willing to please. Turtle has won with Challenged riders, beginners and advanced riders. While her name is Turtle, she has a huge hunter stride. Turtle will also settle into a slow Western jog and lope that will take you all day to get anywhere. Let Turtle show you how much fun riding can be for you. Okie Dokie Zip (aka Zip) is a registered Appaloosa and also registered with IBHA and ABRA. She is a money earner on the NRHA circuit. She has competed at the World and National Level. Versatility is her strength. 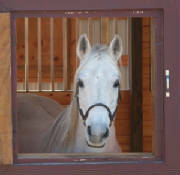 Zip will teach you how to compete in Western Dressage, Trail, Western Pleasure and Ranch. If you want to learn about buttons on a horse, she is your girl. AM LetmeDance (aka Dansir) is one of our lesson horses. He is very freindly and well trained. 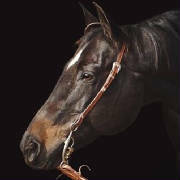 He has competed at the regional level in Dressage, English Pleasure, Western Pleasure, Showmanship, Trail and Reining. He will give you confidence in riding while being gentle as you learn.